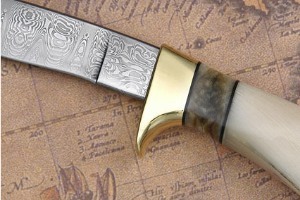 The blade incorporates complex mosaic Damascus forged into a Gent's Pronghorn profile. The heat treat follows the formulas developed by Ed Fowler, Bill's teacher, and has been proven to create some of the sharpest and most long lasting edges found anywhere. 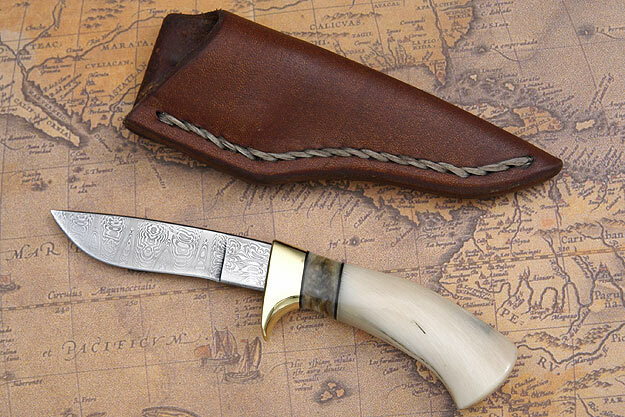 Bill has also followed the traditional Pronghorn pattern by using a brass guard. 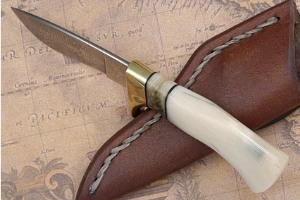 Rather than using sheephorn, however, Bill has used musk ox horn for the handle. This extremely rare horn has a nearly translucent quality and is extremely engaging. The horn swells at the palm and toward the base for a very comfortable hand hold. 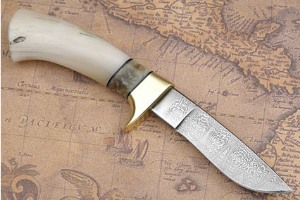 Cross cut sections of musk ox horn are set side-by-side creating a spacer at the front of the handle. Excellent fit and finish throughout.